Click here to find out more about Awesome Guitar Kids for your talented year 01 - year 08 child. Click here to learn and master guitar basics that always work whether you are 13 or 93! What do you most want to learn about today? If you live in the inner city Auckland area, Grey Lynn guitar lessons would be very convenient for you. During off peak hours, when traffic is light, driving to Grey Lynn for your guitar lessons, is surprisingly quicker and easier than you might at first think. Especially compared to parents who drove their children from Papatoetoe, Mangere, Swanson, Devonport and Takapuna to guitar lessons at Browning Street at peak traffic times. There are a range of guitar teachers, conveniently located near you so that you don't have to do Auckland peak hour traffic. Several are listed below here. 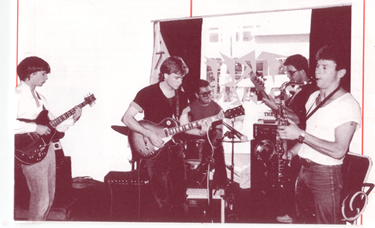 Guitar Teachers Ross Hill and Chris Lloyd playing a long gone Symonds Street cafe in 1984 at a School of Creative Musicianship Graduation Gig. I recommend Ross Hill, North Shore as a classical guitar teacher to check out. If you are out of Auckland, consider these teachers. Guitar shops can also help you locate guitar teachers. Some shops have their own teachers. And they operate music programmes of their own, for Weekend Warriors and Rock Academy Kids. As a graduate of the Guitar Institute of Technology and Grove Music School, the Guitar Teacher is well qualified to prepare you to succeed in any tertiary course listed below. If you're a North Shore parent looking for music programmes for your children, consider these Browns Bay options. Here are other music services that serve guitar learners and players in supportive ways. Copyright © 2009 The Guitar Teacher.